After a two-hour drive from Maheshwar, a boat took us the short distance across the Narmada river to the island of Omkareshwar. We arrived at an ashram on a quiet part of the island. We were welcomed by a friendly Israeli swamy dressed sadhu-style in saffron robes and rudraksha beads. 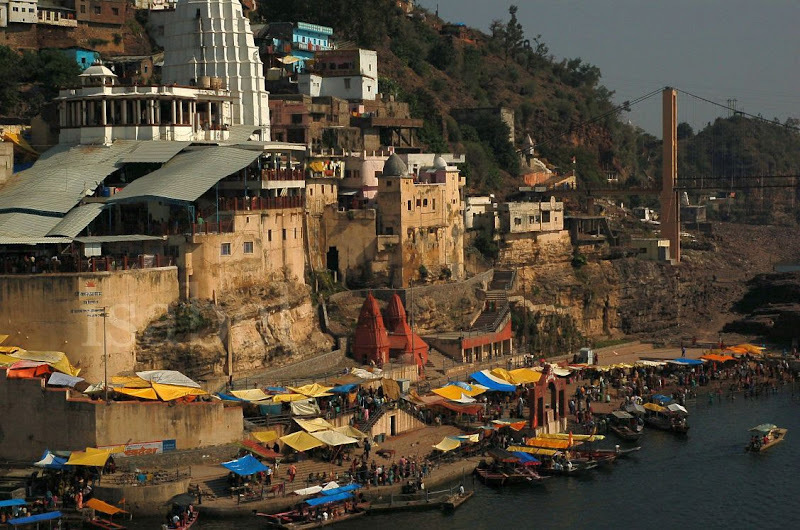 Omkareshwar is also one of the 12 sites in India to have a jyotirlingam (a natural rock linga where the god Shiva manifested himself in the form of light). Some people told us that the lingam is found in the towering Sri Omar Mandhata temple on the island. Others said that it’s in the Amareshwar temple just opposite on the mainland. The third version I heard was that there are two lingams, one in each temple! The island is a popular pilgrimage destination. We took the pilgrim trail which circumambulates the island and were greeted with a cheerful “Hari Om!” by every sadhu, pilgrim and child we met on the way. We also got a taste of what it must be like to be SRK when we were mobbed by a crowd of college kids who all wanted to shake our hands and have their pictures taken with us! Along the way we passed several shrines and temples. One part of the island had a Disneyland-feel to it, with temples crudely painted in bright colours. But in contrast, the 10th century Siddnath Temple was stunning with its natural rock and beautiful sculptures. Later we joined the horde of local tourists and took a boat trip around the island. 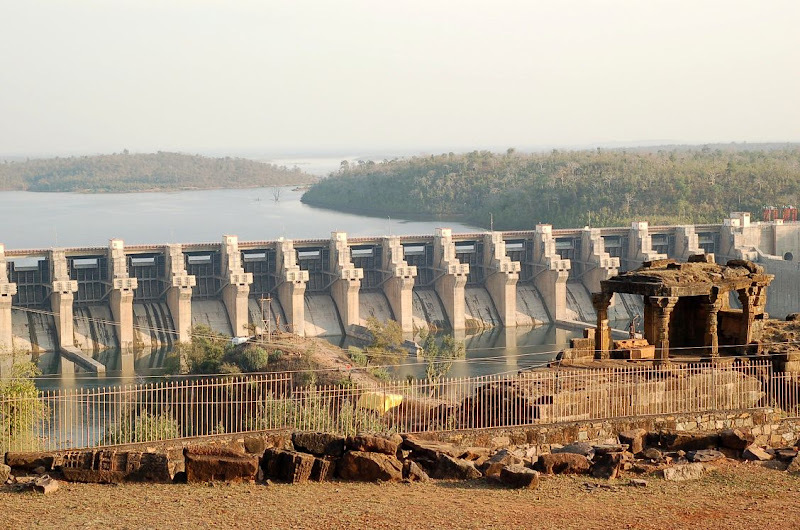 It was smooth sailing until we reached the sangam, the place at the tip of the island where another of India’s seven sacred rivers, the Cauvery, gushes violently into the Narmada. We all had to disembark and walk the short distance to the Cauvery side while the boatmen jumped into the water and pushed the boat through the strong current around the tip of the island. In the meantime many people took the opportunity to have a dip in the sacred waters. At the other end of the island we passed in front of the massive (and controversial) Narmada dam, another significant landmark in Omkareshwar. My next post will be on another magical place in Madhya Pradesh: Mandu! Nice post! I am not sure whether u are aware of one of the Hindu Samsakara of 'Mundan'.I have one of my memory associated to Omkareshwara, when I was six months old my mundan was done on the ghats of this holy place.Mundan is bascially when the babies head is shaved,for the first time after baby's birth. Hey you belong to which place originally ? i had one of my acquaintance with ur name in France.